Written by: Chris Papastamos, M.A. CPC, CSD and Jim Folk. Brain zaps and head shivers are common anxiety symptoms that feel like your brain or head was suddenly jolted, buzzed, zapped, electric shocked, or had a tremor. It feels as if your head or brain has been suddenly jolted by an electric shock or electrical charge. It feels as if your head or brain has been zapped, buzzed, shocked, jolted, or had a sudden "brain, head, or body tremor or shiver." It feels as if your brain has had a sudden shiver, tremor, or vibration. Some people feel this brain zap in just the brain whereas others feel the brain zap in the entire head. Brain zaps, brain shakes, head zaps, brain shivers, tremors or sudden vibrations generally last only for a few moments. Brain zaps, shakes, shivers, jolts, tremors or vibrations occur without warning, although some people say they can feel them coming on. Brain zaps, shakes, shivers, jolts, tremors or vibrations most often stop just as suddenly as they begin. Some people say they also experience a burst of bright light with the brain zap. Some people say their eyes shake with the brain zap. Some people say they experience momentary dizziness or lightheadedness with the brain zap, which can linger after the brain zap has stopped. Some people say they experience ringing, buzzing, or pulsing in the ear(s) during and after the brain zap. Some people become nauseate or sick to their stomach during and after the brain or head zap. Many people become frightened that the brain zap is an indication of a major medical or mental health problem. Some people are quite shaken by the brain zap, which leaves them anxious and concerned about having another one, or another brain zap that is far more serious and lasting. This list is not exhaustive but represents the most common descriptions of the anxiety brain zap symptom. This symptom can feel like it occurs in the brain only, in the entire head, or some people experience the zap feeling in the entire body. Brain zaps can also occur in the brain only during one episode and then affect the entire head during another episode. Brain zaps can also shift where during one episode it occurs only in the brain, the next episode it occurs in the entire head, and then the next episode it occurs only in the brain again, and so on. Brain zaps and head zaps typically occur sporadically and without warning. Brain zaps can precede, accompany, or follow an escalation of other anxiety sensations and symptoms, or occur by itself. They can also precede, accompany, or follow an episode of nervousness, anxiety, fear, and elevated stress, or occur ‘out of the blue’ and for no apparent reason. Brain zaps and head zaps can range in intensity from slight, to moderate, to severe. They can also change from episode to episode, where one time the brain zap was severe and at another time the head or brain zap was barely noticeable. The brain and head zaps symptom can change from day to day, and/or from moment to moment. Since each body is somewhat chemically unique, each person can have a unique experience with brain and head zaps. Therefore, all of the above combinations and variations are common. These types of symptoms can seem more disconcerting when undistracted, resting, doing deep relaxation, or when trying to go to sleep or when waking up. When this symptom first occurs, it can be quite alarming, and can even cause the start of a panic attack because of the sudden fear you experience. Thoughts of “what if this is a symptom of a brain tumor or cancer, or the result of MS, ALS, or other more serious medical condition” are fears commonly associated with those who experience this symptom. Because of the bizarre nature of this symptom, it may even make you truly believe something more dramatic will happen next. What causes brain zaps, head zaps anxiety symptoms? benzodiazepine medications such as Ativan, Xanax, Valium, and Klonopin. It was once thought that low serotonin was the cause of anxiety disorder (and depression). To treat this “chemical imbalance,” patients were given antidepressant medications that were thought to increase the deficient chemicals, and over time, restore them (serotonin and norepinephrine) back to a healthy level. But people taking these medications often experienced brain zaps as a side effect of these medications. Theorists speculated that brain and head zaps were caused by low levels of serotonin and how the medications were trying to elevate them. There are problems with this theory, however. Many people have low levels of serotonin yet don’t experience brain or head zaps. GABA (Gamma-Aminobutyric Acid) is the brain’s primary inhibitory neurotransmitter responsible for calming the nervous system. Low levels of GABA have been linked to many conditions, including anxiety, depression, seizures, and movement disorders. Research has found that low levels of GABA can trigger seizures. This raises the possibility that conditions that cause a reduction in GABA, such as anxiety and depression, can cause brief episodes of localized seizures, such as brain zaps and head zaps. Seizures are caused by the over-excitement of neurons that then cause an “excessive, hypersynchronous discharge” in the brain. This discharge can cause abnormal neuronal firing that sends uncontrolled neurological signals to the rest of the body causing convulsions and loss of consciousness. Minor localized seizures, however, produce a small effect. This localization is thought to account for the brain zaps and head zaps symptom where the effects of the “electrical shock” feelings are minimal. Brain and head zaps are often associated with withdrawing from psychotropic medications, such as SSRIs, SNRIs, and benzodiazepines, as well as some sleep medications. Since SSRI and SNRI antidepressants, benzodiazepine, and some sleep medications cause an increase in GABA, it’s thought that withdrawing from these medications cause a reduction in GABA. The decrease in GABA is responsible for the brain and head zaps. People who don’t take psychotropic or sleep medications also experience brain zaps and head zaps. Chronic stress, which we call stress-response hyperstimulation, is a common denominator for those who experience head and brain zaps. I personally experienced many head and brain zaps during my struggle with anxiety disorder. I didn’t take antidepressants, and I had many head and brain zaps long before I took benzodiazepines. Consequently, I tend to lean toward the following explanation as being the cause of anxiety-caused brain zaps and head zaps. 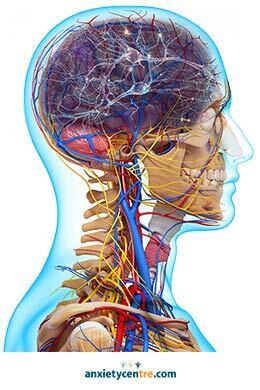 Chronic stress, such as the stress caused by overly apprehensive behavior, has a deleterious effect on the body, and in particular, the nervous system (which includes the brain). Chronic stress not only affects neurotransmitter levels, including GABA and Glutamate, the body’s primary excitatory neurotransmitter, but it also adversely affects neurons and how they function. Consequently, hyperstimulation can cause the over-excitation of neurons similar to the cause of seizures, but on a smaller, more localized scale. According to an online survey we conducted, just less than half of anxiety disorder sufferers experienced brain zaps and head zaps due to anxiety disorder. Recovery Support members can read more detailed information about the link between anxiety, hyperstimulation, and brain and head zaps in our Anxiety Symptoms section (chapter 9). Chronic stress and its effects on the body are a common cause of brain zaps and head zaps. How to get rid of the brain zaps and head zaps anxiety symptoms? If you suspect your medication is causing your brain and head zaps, talk with your doctor and pharmacist about switching to a medication that doesn’t have this symptom as a side effect. While the transition to another medication might bring its own challenges, you might tolerate the different medication far better and with fewer side effects, including this one. If your brain zaps and head zaps are caused by discontinuing your medication, they should subside as your body clears the medication and stabilizes. Following an appropriate tapering schedule is vital when discontinuing a psychotropic medication. Talk with your doctor and pharmacist for more information. DO NOT STOP A PSYCHOTROPIC MEDICATION ABRUPTLY! Doing so has the potential to cause serious harm. If your brain and head zaps aren’t caused by medication, they are most likely caused by chronic stress (hyperstimulation). The overall goal, then, is to work at eliminating your body’s unhealthy stress. We list a number of natural ways to reduce stress in Chapters 4 and 14 in the Recovery Support area. We also explain hyperstimulation, its adverse effects, and why recovery can take so long in great detail in Chapter 14, as well. If you’ve been working at reducing your stress, but your symptoms remain, there could be many reasons for this, which we explain in the Recovery Support area. Being aware of these barriers to recovery, and then working to address them, can lead to success. Unidentified and unaddressed underlying factors that cause issues with anxiety is the number one reason why anxiety disorder and its symptoms persist. This is why dealing with your anxiety issues is the most important overall. Since the majority of stress comes from behavior (the ways we think and act), addressing the core reasons for anxiety disorder can reduce and eliminate the unhealthy stress that often leads to hyperstimulation and symptoms, such as brain zaps. If you have been struggling with anxiety and symptoms, we recommend connecting with an experienced anxiety disorder therapist to help you overcome your anxiety issues. Research has shown that working with an experienced therapist is an effective treatment for anxiety disorder. Play the clip below for Jim Folk's commentary about the brain zaps anxiety symptoms. Jim Folk is the president of anxietycentre.com. Brain zaps are common symptoms of elevated stress, including the stress anxiety can cause. Jim Folk experienced many of them during his 12 year struggle with anxiety disorder. When the body is under stress, it uses up its energy resources, including important nutrients, faster than normal. If we aren’t replenishing those nutrients as fast as we are using them up, the body can run into a nutrient deficiency. Eating a healthy and balanced diet can keep the body healthy even during stressful times. Some people have also found eating foods that promote GABA restoration beneficial, such as kimchi, kefir, miso, sauerkraut, tempeh, and yogurt. Others have found taking GABA supplements helpful. Caution is required, however, as research has shown that too much GABA can create the same problems as not enough. Working with a Natural Nutritional Therapist, such as Liliana Tosic, can be helpful in this regard. We also don’t recommend running out and taking supplements recommended by health food websites. Since each body is somewhat chemically unique, what might work for one person might cause problems for another. We recommend working with a Natural Nutritional Therapist to determine your exact deficiencies and then needs. Taking too much of something can do as much harm, if not more, than not getting enough. Moreover, recent research has found that most popular supplements provides no health benefit, and therefore, are a waste of money. We believe if supplementation is required, it’s best done through a healthy change in diet rather than via pills. Hypnic jerks are a natural phenomenon many people experience when drifting off to sleep. In a 2016 study, researchers report that 60% to 70% of the general population experience hypnic jerks. A hypnic jerk – myoclonus - is an involuntary twitch of one or more of the body’s muscles that occur as you are transitioning from a wakeful state to a sleeping state. They can range in degree from barely noticeable to so dramatic that they startle you awake. Even though these sensations can be alarming, they are not an indication of an underlying medical or mental health problem. Hypnic jerks are common and a part of our human experience. While there is no specific cause of hypnic jerks, stimulation seems to play a role. The more stimulated the body is when going to sleep, the more likely you’ll experience a hypnic jerk. Reducing the body’s stimulation overall can reduce the incidences of hypnic jerks. We explain this and other recovery considerations in more detail in Chapter 3 in the Recovery Support area of our website. If you have been struggling with persistent symptoms and nothing you do seems to help, you may want to join our Recovery Support area and read about why symptoms can persist in spite of our best efforts. 7. Cortes, Jose A., and Rajiv Radhakrishnan. “A Case of Amelioration of Venlafaxine-Discontinuation ‘Brain Shivers’ With Atomoxetine.” The Primary Care Companion for CNS Disorders, Physicians Postgraduate Press, Inc., 2013, www.ncbi.nlm.nih.gov/pmc/articles/PMC3733524/. 9. Hofmann, Stefan G., et al. “The Efficacy of Cognitive Behavioral Therapy: A Review of Meta-Analyses.” Cognitive Therapy and Research, U.S. National Library of Medicine, 1 Oct. 2012, www.ncbi.nlm.nih.gov/pmc/articles/PMC3584580/. 10. Leichsenring, Falk. “Is Cognitive Behavioral Therapy the Gold Standard for Psychotherapy?” JAMA, American Medical Association, 10 Oct. 2017, jamanetwork.com/journals/jama/article-abstract/2654783. 11. Thompson, Ryan Baird, "Psychology at a Distance: Examining the Efficacy of Online Therapy" (2016). University Honors Theses. Paper 285. 12. Kingston, Dawn.“Advantages of E-Therapy Over Conventional Therapy.” Psychology Today, Sussex Publishers, 11 Dec. 2017, www.psychologytoday.com/us/blog/the-pregnant-pause/201712/advantages-e-therapy-over-conventional-therapy. 16. St. Michael's Hospital. "Most popular vitamin and mineral supplements provide no health benefit, study finds." ScienceDaily. ScienceDaily, 28 May 2018. www.sciencedaily.com/releases/2018/05/180528171511.htm. 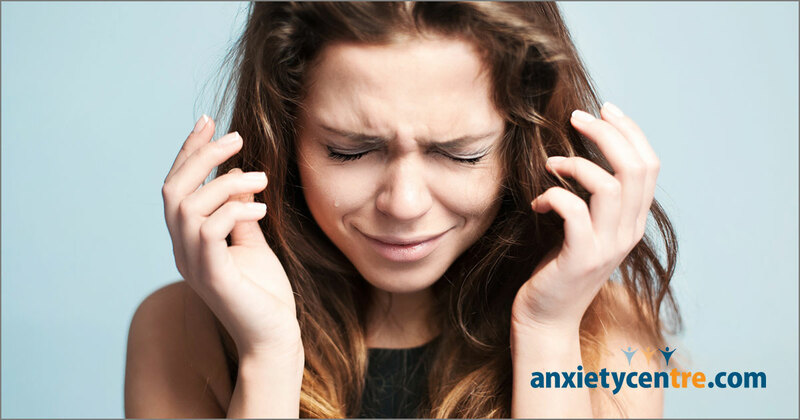 Return to our symptoms of anxiety page. anxietycentre.com: Information, support, and coaching/counseling/therapy for problematic anxiety and its sensations and symptoms, including brain zaps.